A Reading Life is a blog series focused on the literature that has shaped my life and call to ministry. Find the introduction here. In the afterword of my recent book, A Whispering Call, I outline the waning market for first-person narration. Jonathon Franzen, guest editor for the Best American Essays anthology of 2016, states that we stand in the Golden Age of memoirs; while Jia Tolentino of the New Yorker lamented that the “personal essay boom” has come to an end. Regardless of various naysayers, I personally love memoirs. Memoirs record the inner journey of the soul while affirming the resiliency of lives who carry the burdens born of both tragedy and comedy. I just finished reading, God Underneath, by Catholic priest, Edward Beck. In his own afterword, he wrote that his memoir aims to help people see the priesthood differently, past the clergy collar. He wanted to humanize his position while helping his readers realize that God is in all the details of life. Only the memoir genre allowed him to tell his story and express all of the settings in which a priest may find himself. Perhaps I like memoirs because I have spent decades reflecting on my own journey of faith and vocation. Hearing God’s call, fashioning a community that knows how to discern God’s call, and responding to God’s call have to be the best parts of my ministry. Heck, vocation is the undercurrent of my newest book and of this blog series! Memoir makes for great sermons too. In reading Beck, I was reminded of my own struggle with pastoral presence and image, and how I have incorporated that into my preaching. I am familiar with the feeling he expresses about needing to lose the frock to deepen friendships. I resonated with his efforts of encouraging others to relate to him as a normal individual, pushing towards a more “confessional” style that connects with congregations. I agreed that when people put us ministers on pedestals, it is easier for that kind of idol to fall and break into a million pieces like Dagon before the ark of the covenant. Memoir can turn tragic real fast when people place unrealistic expectations upon you. And memoirs remind us that we are all made in God’s image and called to be priests in one form or fashion. My Baptist tradition specifically grants us the mantle of the priesthood of believers. Dismantling unrealistic images of the ministry does not lessen how people see me, but lifts people up and persuades them to seize God’s destiny in their lives. My wife tried to tell her who Jesus is (and who he isn’t), but it got a great belly laugh out of all of us. My music minister now has a lot to live up to! Edward Beck mentions that people ask him about his calling: “When did you receive your call, Father?” And every time, he responds, “I am still receiving it!” God’s call continually provides opportunities for us to bear witness to Christ’s love. Are we willing to move beyond our own self-image and see ourselves through Christ’s eyes, then see others as Christ sees them? What memoir might we write, and how does God show up in it? I must apologize, everyone. I have not been in the mood to read or write lately. I blame it on the recliner and cold weather. My cat may be in on this too. Its been an arid month: no inspiration to read anything, no impetus to write. I had an existential crisis just today: How come I don’t feel like reading? What about my “A Reading Life” blog series? It was just, “Meh.” I suffered from Seasonal Affective Disorder when I lived in the north, but haven’t since I moved south. This is nowhere near as bad, but I have a feeling that people who do suffer with SAD during winter can relate. Where has all that passion gone? Now I just sit in my recliner when I am not cleaning, exercising, playing, cooking, or doing churchy things. I read a devotional. I catch up on the news. I (gag) scroll through social media. I fall asleep with my cat on my lap, a cat who finds her way over to me whenever I am in a resting position. This is not new for me just as I’m sure it inflicts other bibliophiles. You’re in between books. You pick up a book here or there and nothing really captures your heart. There are false starts and impassioned leafing through of pages. No titles catch your attention. You wonder why half the books on your “to read” pile are there in the first place. Even the old love affair with book catalogues grows stale, and your eyes wander to other things. I started watching a lot more television. That’s always a bad sign. I don’t know how it is for others, but for me, reading and writing go hand-in-hand. If I am reading a lot then I tend to write a lot. If my reading tarries, my writing dries up. The muses fall silent. The Television turns on, and it is a distraction. I decided today that I must move on. I can’t stay in this malaise forever, and I need something to get out of this rut. We went to our local used-book store (a weekly routine), and I determined to find something to read. Sure enough, I returned to that genre that has saved me on more than one occasion: long-form essays, usually in the tune of a memoir or travel narrative, which have appealed to me during times of melancholy. They are short so there is no serious commitment. They are not laborious, so they tend to be compelling and artistic. They inform, but are personal enough to get me out of myself–to move my sense of consciousness beyond my little world and into the larger world where life moves on. Essays have always been an easy and quick escape in my reading repertoire. There are essays by Marilyn Robinson and Annie Dillard. There are anthologies, such as the annual The Greatest Essays publications. Several years ago I picked up This is New York by E. B. White, an essay that originally appeared in a travel magazine. That was SOME essay–an amazing tapestry of words and thoughts, and probably one of the best things I’ve ever read in my life. It took me a while to find the right book. I perused travel, biographies, classics, mysteries, and the religious sections. I was tired, so I sat in a plastic lawn chair among the memoirs. I spotted an autobiography by Ephriam Tutt, Yankee Lawyer. I don’t know who Tutt is, but the inscription on the inside was to an “Uncle Harry” and dated Christmas day, 1943. Parker Palmer’s Listen to Your Life was nearby, and it too had an inscription from Jen to Mitch: “Food for thought along your vocational journey.” It was dated January 25, 2002. Not quite Christmas day, but close. And, back in the memoir section, I finally found a book worth reading. It is an essay just as I preferred, and published originally in Vanity Fair or some such magazine. It is by Pulitzer-prize winning novelist William Styron, Darkness Visible, about his bout with clinical depression. The subtitle (“A memoir of madness”) did not catch my attention so much as the writing did; and I didn’t get it because of my own lethargy. I got it because of its brevity and its well-written prose. It will do. I realize now that my feelings of lassitude is not uncommon around this time of year. Many people get a little angst around the holidays. 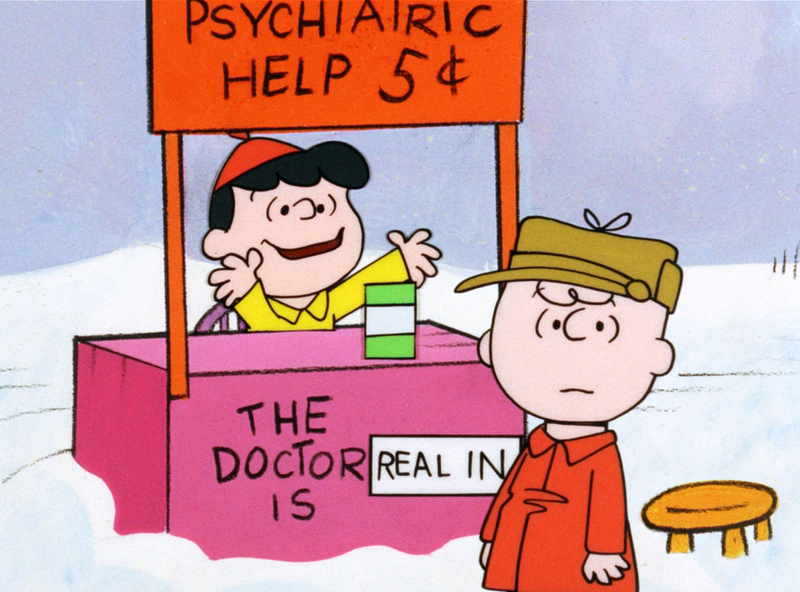 Charlie Brown bemoans of his own existential crisis to Lucy (psychiatric help for a nickel!) in the Christmas special my children and I watched earlier today. But ’tis the season, and books will always find a way to speak into our lives. We will eventually move off the recliner and into worlds that words construct or conjure. It takes some time, and in only a few days that Christ Light will shine in the darkness of all our nights. And, eventually, this too shall pass. My room, lovingly called “the Cave,” in Havana, Cuba. Complete with vintage sewing machine-turned-writing desk. This is the first part in a multi-part article series on my “reading life”. Enjoy! On a recent mission trip to Cuba, I spent some time reading C. S. Lewis’ memoir Surprised by Joy. Like other books by Lewis I’ve read, I found it hard to follow his line of argument, narration, British idioms, and the writing in general. I am accustomed to reading dated literature–most of my favorite books come from the early 20th-century–but it is just that I have never been a fan of Lewis in the first place. Don’t judge me. The one thing I did enjoy about Surprised by Joy (and I’m glad there was one thing, since, in Cuba, I had nothing else to read) was how the rhythm of Lewis’s upbringing can be measured according to the books he read. Every season of his life was marked by tragedy and triumph, as well as an exposure to literature that came his way. Lewis speaks of his father’s personal book collection, his favorite reading in school, the tutor who introduced him to Homer, and his on-going love affair with mythology and poetry. Every coming-of-age tale he tells accompanies a movement towards a new genre of literature. When he eventually gets to his Christian conversion, it comes by way of the joy that literature brings to his life. I am a reader too. When I look back on my life — (again, something I had a lot of time to do while awaiting sleep in my room, lovingly called “the Cave”, in Cuba, sans television and internet) — I can easily see how literature also acted as a thread throughout my life. From The Berenstain Bears and the Spooky Old Tree to everything written by Barbara Brown Taylor, I remember most of the books that have shaped my life and accompanied me through good times and bad. Why not, like Lewis, try to record it for the ages? So over the next few months, that’s precisely what I intend to do — narrate the seasons of my life through books, a “reading life,” as it were. I love reading, and I love reading articles about reading, so I hope that these little chestnuts along the way will encourage you, bolster your love for books, and invoke some great conversations of the central place books play in the lives of bibliophiles across the globe.